This has been the most fun for me. I have to take you back to my daughter's wedding again. 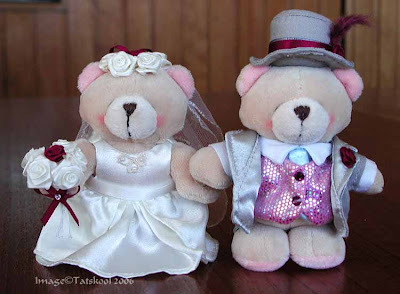 I was taken by a pair of wedding bears....I LOVE BEARS! So I thought it would be nice to customize them in the wedding colours. 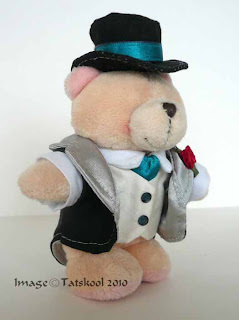 The Groom Bear got a burgundy hatband and feather, Swarovski crystal burgundy buttons and a burgundy flower. He kept his grey suit as the real groom was to wear grey tails. the waistcoat colour looked good and I didn't know what was to be worn. The Bride Bear swapped her bouquet for cream and burgundy roses and a burgundy ribbon, and a headdress of the same roses and ribbon. 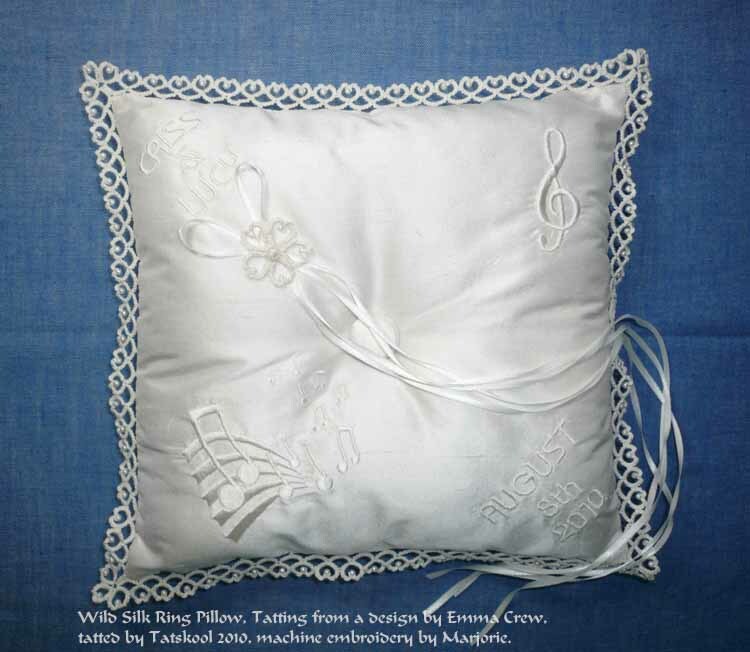 Her dress has a medallion of dimpled ring hearts like on the ring pillow, and her waistband was a cream ribbon. 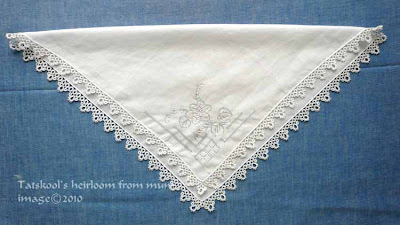 Her veil was scattered with little tatted flowers with bling crystals in their centers. Her veil was edged very simply. I was itching to do this again for my son's wedding but despite searching the shops I couldn't find the bears again...they must have been discontinued. and lo and behold there was a pair of bears for the taking, was this fate? Oh the agony of bidding! Apart from his hat being perched rather perilously on his head he looks very smart. This time the real groom will be wearing black top hat and tails so this was a bit more of a challenge. I haven't been near a pot of dye in a couple of months...but this should be easy...shouldn't it. 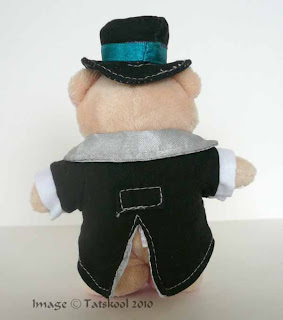 Took all the stuffing and card out of his hat and had to take his outfit to pieces as the shirt and waistcoat were attached to the jacket and so were the cuffs. Stitched the sleeves back on with white thread. so they wouldn't fray .....well it's all going to be black isn't it!! of the grey satin collar and lining....and the grey and white thread!! Of course I should have realised that a cotton dye doesn't dye polyester!!! A second dyeing produced a richer back....his hat band went a deep blue! Matching buttons of Swarovski crystals, teal hatband and a red rose and he is ready. 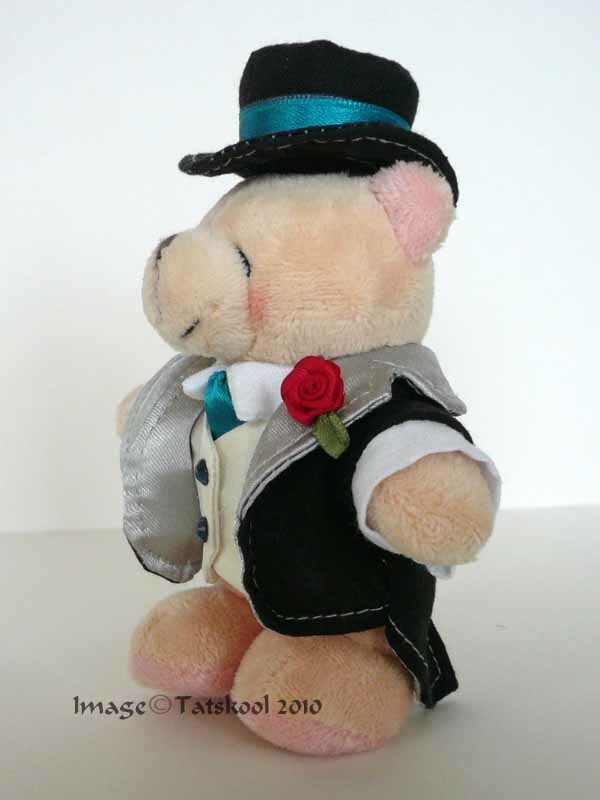 Doesn't he look such a toff!! Every time I look at him I see my son! Doesn't the contrasting collar and lining and stitching look great. 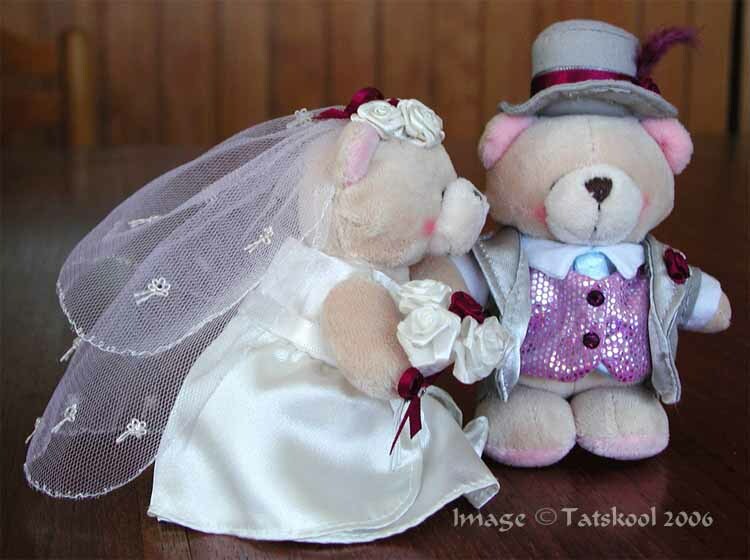 A great comment came in about the last post..saying that the Leps will be wanting to be a part of the wedding party! 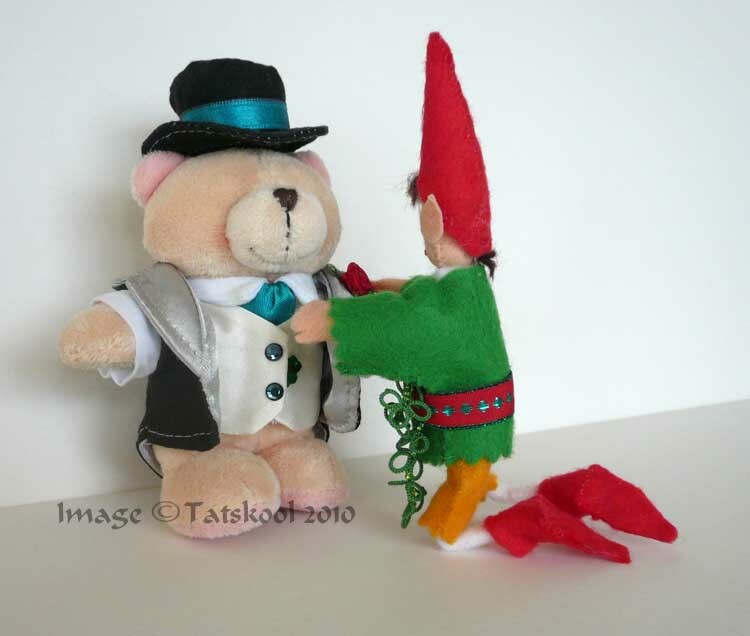 Well didn't I catch Tadgh sprucing up Groom bear. Decided that he would be his personal dresser for the wedding. Can you see what the little blighter slipped into the waistcoat?? Tadgh said that there had to be Irishness there! 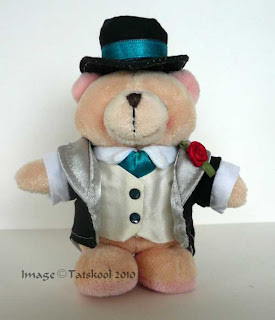 and that Groom Bear would need a bit of good luck!! I received another envelope of hearts....thanks a million Suneeti...that did help a lot. So I knew what was left to do....of course I did get carried away...as usual! 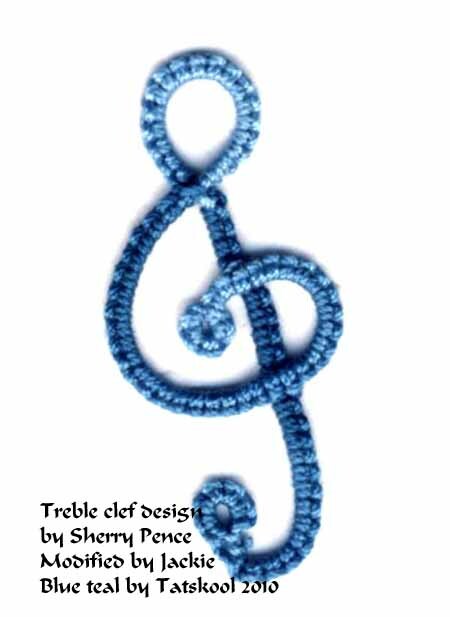 I kept coming across Treble Clefs and Hearts in unexpected places and finally thought what the heck, I will tat 'till I drop!! That should probably have read 'till my fingers drop off. I can speed tat and these hearts I can do in my sleep! Found that I could tat one heart in about 20 mins, that's if I breathe at the same time!! and could tat 11 (5.5 pairs! )in an evenings TV watching.....jeepers that 3 hrs 40 mins!! I must have clocked up an extra 25 pairs...and then my fingers fell off! ouch. the 4 at the bottom are for ME! They are a motley assortment, of colours and shapes and sizes......but then so are wedding guests. 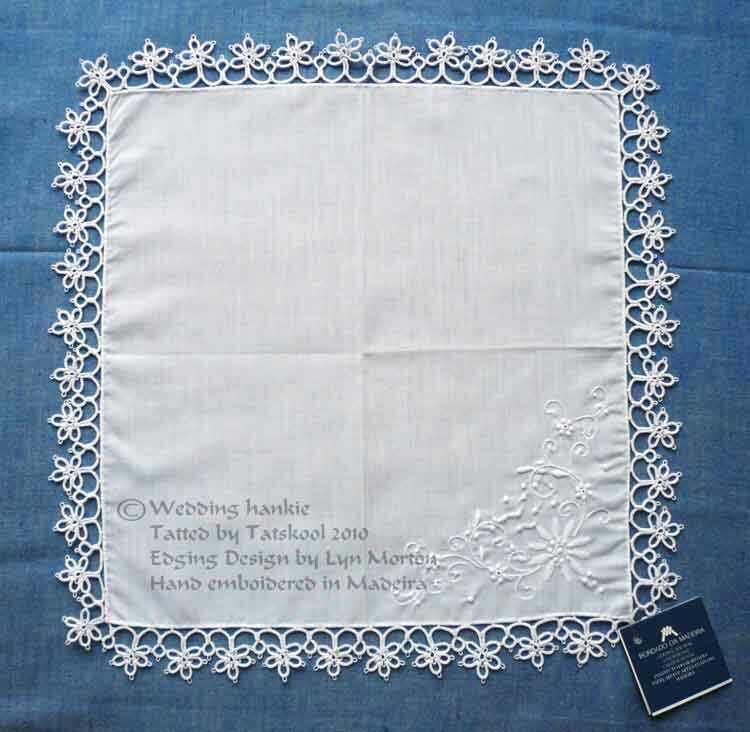 I think every one is a winner, thank you so much my tatting gnomes, I couldn't have done it without you....or the designers Jane and Sherry for their inspiration, . Even the glueing and sleeving took days. But now I can concentrate on my fun project. Daughter's birthday yesterday, this is the card I made for her.....3D Decoupage. First time I have heard her call him that. he is 21 months now. Sent a tingle down my spine. The party......my summer tat party......tat, talk, tat then eat.....preferably outside. 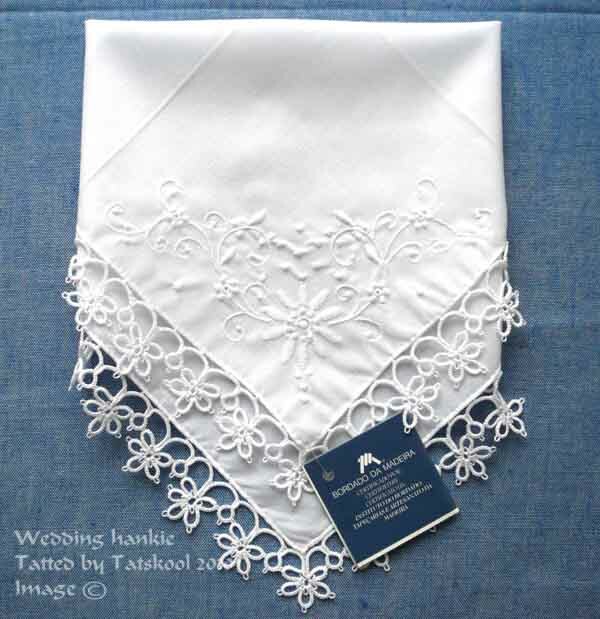 Showed them all the things that I have made for the wedding and they advised on alterations to my outfit. The new display stand for my little trees is finished at last and it's like little friends have returned to their home.....more about this after the wedding when I promise you a blow by blow account....If you think you can stand it. The whole area in front of the stand has been 'done up' and it's BEAUTIFUL. I set up a table and chairs there with the umbrella into the washing line hole and WOW. Then it started to drizzle.... I had booked this good weather weeks ago so finally the weatherman remembered and the sun shone fit to crack the stones. 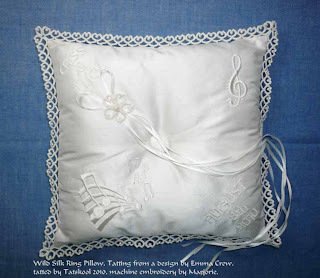 How I love my party with my tatting friends ..they are the best. Wish you all could have come....they brought such goodies.The house elf made yummy Broccoli and Stilton soup. Someone even brought a mackerel smoker to have hot smoked mackerel.....but it didn't work. Well can't have everything. Have to get back to earth and concentrate on the last lap....getting to the fun stuff! Thanks to everyone who commented what a great idea this was....and how nice it was to have participation from other tatters. It's like a big warm hug to have such friends out there. was the time to lay them all out and see how many I have. At the top are the finished ones ready for the plastic sleeves, in piles of 10. Next row are in process of glueing, hearts are on and waiting to have the Treble Clef glued on. Then I come down to a few more recently arrived hearts to glue on as well. as I want to make some extras. 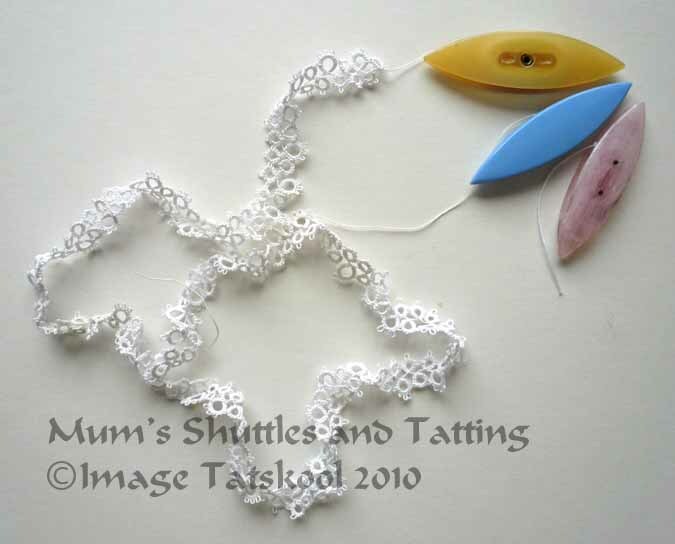 So it's back to tatting hearts....while waiting for the dentist for a start! I will knock off 15 pairs and more...easy peasy....I do have 2 weeks left....almost! 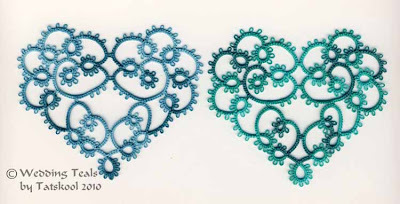 and I will be able to make hearts to match the new treble clefs in the 'gone wrong' Turquoise Teal...which is gorgeous. Did you guess what I was making??????????????? 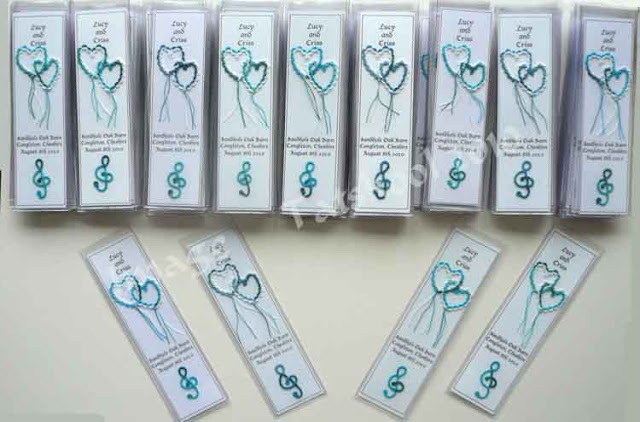 Would I make bookmarks like I did for his sisters wedding? Wowee! he likes his mother's tatting so much . Well it seems that flattery will get him anywhere! What would you have said!!! OK so let's go back in time 4 years to her wedding time. What more can you ask of a friend. An unbelievable number of hearts later and a lot of printing, stamping, cutting and glueing and I had about 130 beautiful bookmarks made and put into plastic sleeves. They even did double duty as place cards as I had the names printed sideways on the reverse. I was so proud of these. Her theme was Burgundy and Fuchsias. 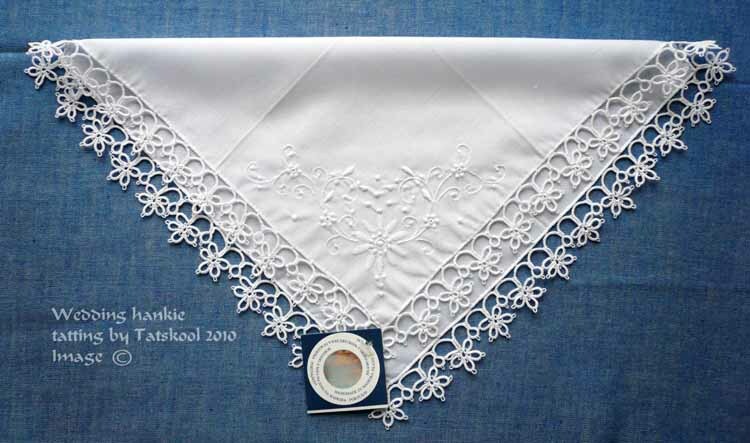 It was a good job that I had made extras to keep as after the meal her day andIi got up for a photo shoot....when we got back our bookmarks and wedding souvenir CD's had been cleared away and put into the bin! and were never seen again. 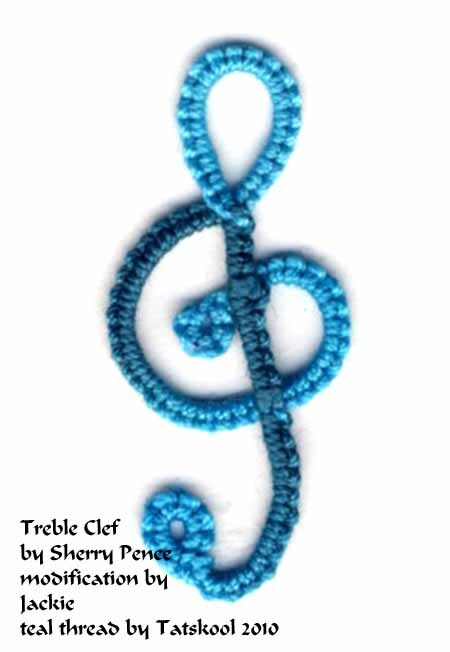 This time the theme is Teal and Music. what have I let myself in for! First job was to dye some thread to match the colour of the Bridesmaid's dresses. Being a thread dyer of course I wanted a variegated thread. It took oh! so many trails, I had to keep going darker, darker, bluer, greener!! I had a tiny tiny piece of material to match...a very dark teal blue. 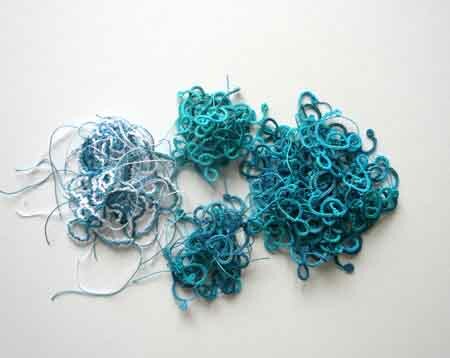 Finally I arrived at two threads that I really liked...a green teal and a blue teal. 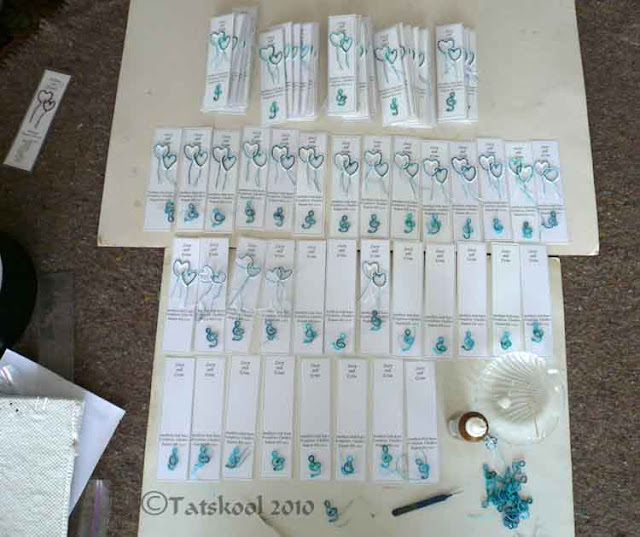 Neither of which were like the sample of material.....but this wedding is going to have a lot of dfferent teals anyway. What the heck I thought, the bookmarks don't have to be all the same! 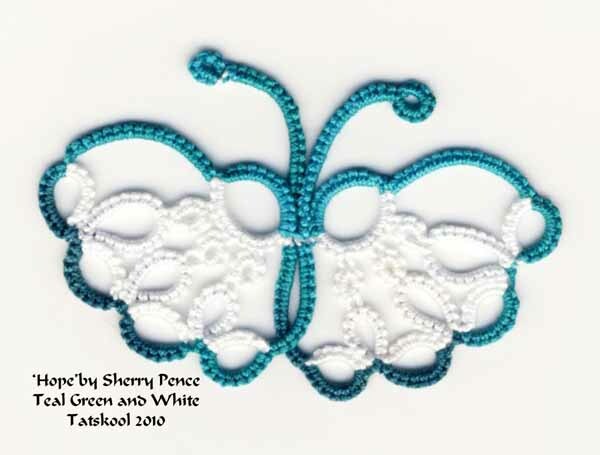 This is a 'Hope' butterfly by Sherry Pence in my teal green that I never showed you. It's one of my favourites. These are the two threads and my favourite Hearts Desire by Susan Fuller. Impossible to show you the true colours. 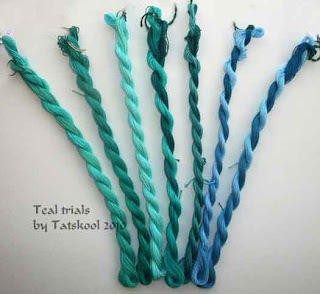 I did end up with a third variation ...a beautiful Turquoise Teal...when the green washed right out of the thread I had had the dye made up so long with all the trials!! I was so taken aback....beautiful but unrepeatable...easily that is. I had offers to tat hearts for me from Suneeti and Isdihara and they worked like trojans. We tatted over 170 hearts between us. The next thing to think about was what to put at the bottom of the bookmark with a music theme. 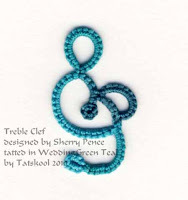 I was just about to buy a music rubber stamp when Sherry Pence showed her Treble Clef design. During our tatting, one of my friends came up with a modified version using chains instead of the folded ring. 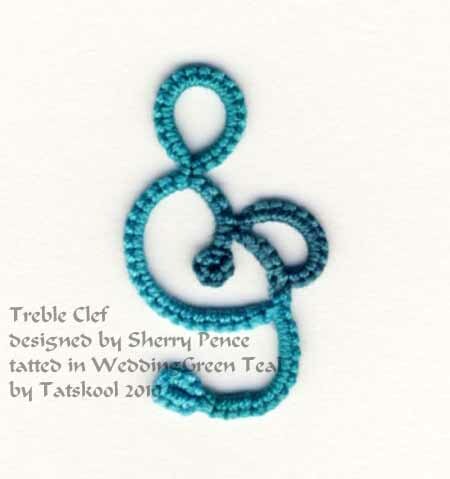 We couldn't decide if the chain should run down the back of the clef or in front so we I ended up with a huge variety of clefs using Sherry's original and Jackie's version. I hope that Sherry doesn't mind us modifying her design.... I really don't like messing with someone else's design. Tomorrow....I really can't put it off any longer I must see if I have enough!! This is a biggy that I have been working on for months, together with my little team of helpers! 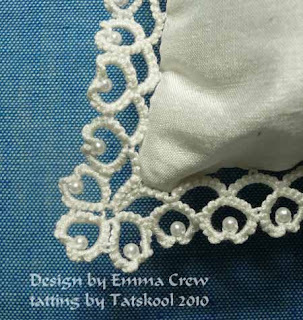 Little tatting gromes, tatting away in their homes! I have two weeks left to get this finished. Better get working on that tomorrow! This time last year we were staying with son and DIL to be....avid readers with long term memory (anybody out there??) will remember that we went to help sonny boy build a deck. What you don't know is what DIL to be and I got up to! Well! we didn't waste our time while the lads were busy in the summer sun! We are now still having our typical July weather.... that is rain, rain and more rain, coupled with wind and temperatures of 16degC....that's about 66 deg F.
It's 21deg C where they live in UK today......it's just not fair!! It's the North Atlantic Drift that affects us....but then we do have lovely green grass!! OK back to last year. DIL to be wanted to make her invitations and had asked me for some ideas. I would have liked to put tatting on all of the cards but that's just not realistic! 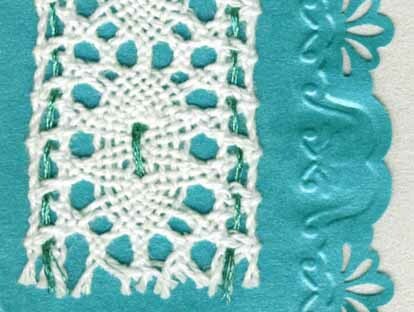 Last year our nephew's invites had a strip of bobbin lace which looked real to me...especially as his sister could have made them. 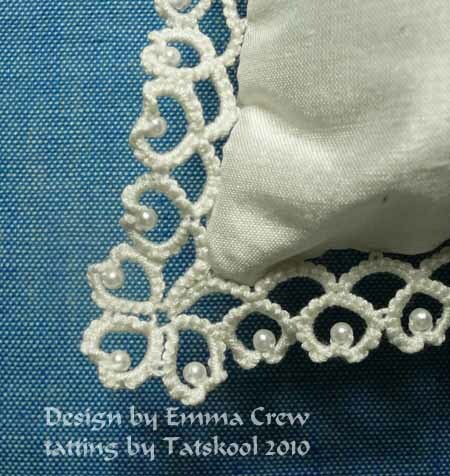 So I looked for some pretty lace...and found some lengths of machine made lace in a chunky cotton which looks a lot like bobbin lace to me.....so made up some sample cards. 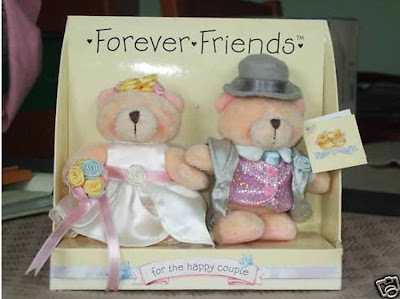 DIL to be liked them a lot, so off we went to SHOP! 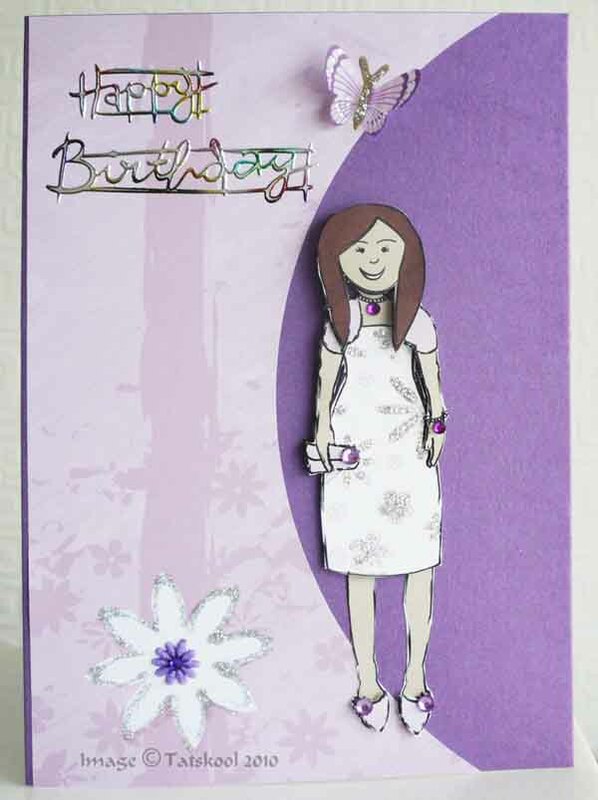 She had never made a card before but she threw herself into the task 100%, and we came back armed with card blanks, pretty pearlised paper, paper cutter, a fancy punch, some metallic embroidery thread and lots of peel offs and some bling....oh and some spray adhesive. I must add that of course this all took more than one shopping expedition, we even had to go to The Lowry Center....near Manchester. 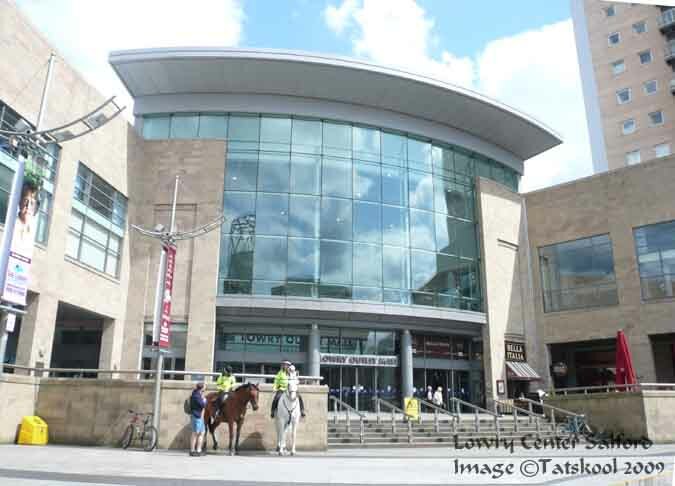 As well as the outlet mall, also on the quays is the Lowry Gallery with a superb exhibition of the paintings of L.S Lowry. Back at base we soon had a bunch of cards made up to her liking. The theme of the wedding is teal....for the bridesmaids dresses and music (and lace of course!). I did the lace which is frayed at the ends and threaded with teal metallic thread...while she did the paper cutting and punching. 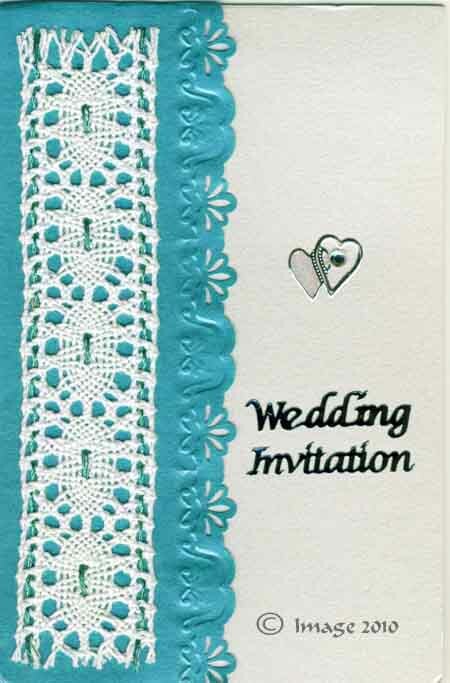 We attached the lace to the card with spray adhesive which worked really well. 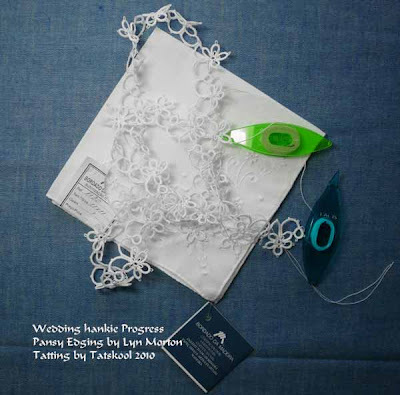 A heart peel off,a gemstone and a Wedding Invitation peel off and we were almost there. She finished them off later with a double insert. First of more pearlised teal paper, and inside that a smaller sheet of white paper with the written stuff! 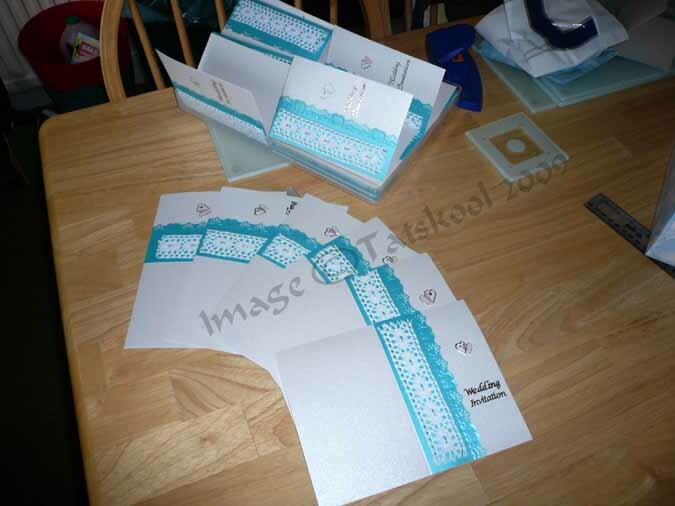 Her mum is making the place cards and the table names an seating chart all in marching teal....should look stunning. the tables are all to named after composers. 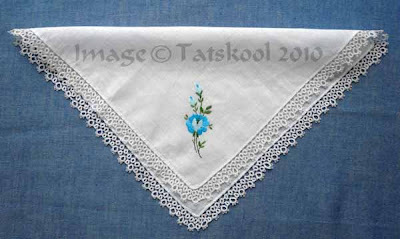 Her mum has also made the teal cravats and hankies for the lads, so she hasn't been idle either!! 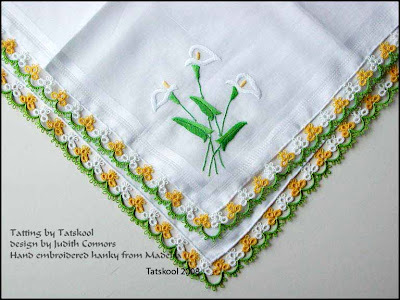 I learned to tat in he late 1950's from a friend in school. She tells me that we were allowed to tat in our home economics class. I don't remember that, if fact I didn't even remember that she was the one who taught us. 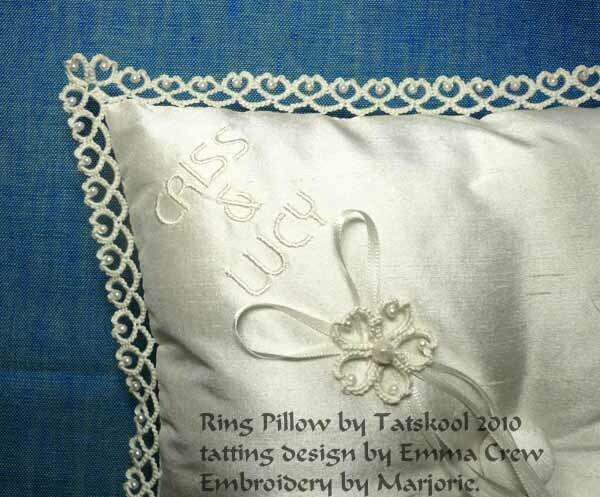 I always had it in my mind that it must of been another of my friends....the real crafty one....I remember to my shame that she gave me a birthday present of two little tubes covered in linen with embroidery on the outside. I was not impressed...I think I asked her what they were for! They were meant to be for keeping hair grips in....I think. 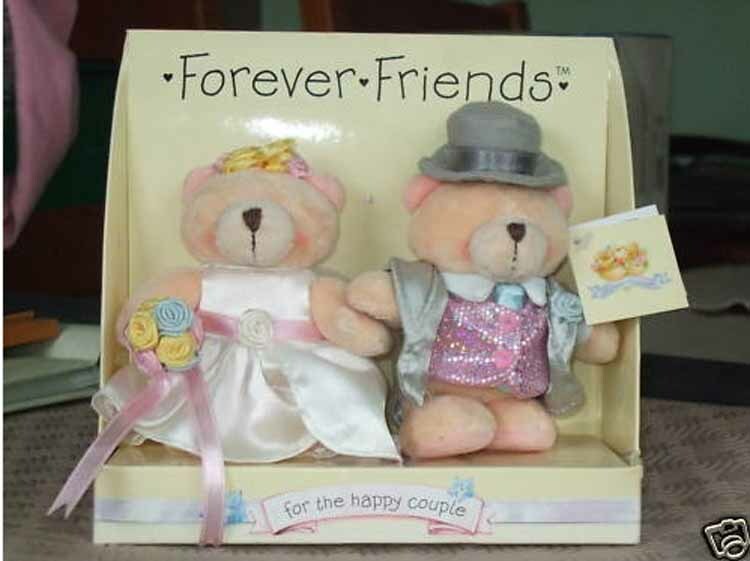 I much preferred what my other friends gave, pretty notelets and teen age stuff.....oh how awful of me. 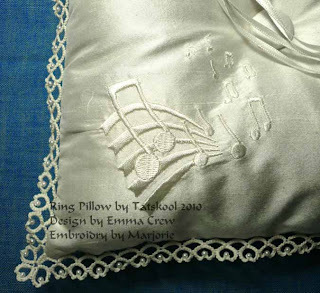 Now I would be so grateful that she took the trouble to make something especially for me. 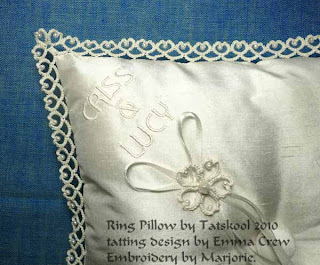 What I do remember is coming home and telling mum that a friend was going to teach me to tat. Imagine my surprise when she said that she thought she had a shuttle in her work box. 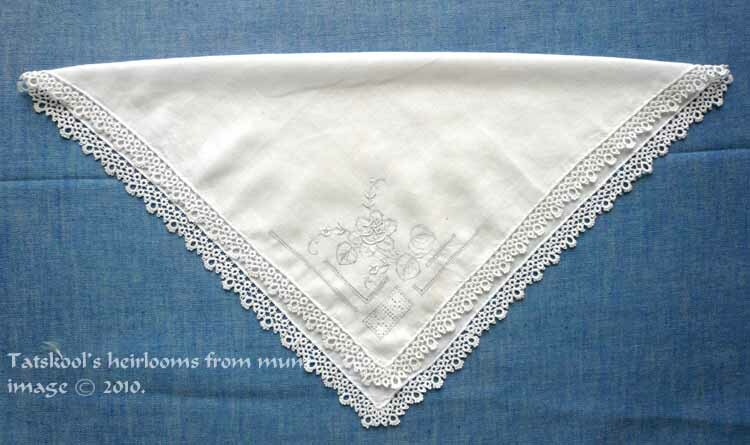 She never saw her mother use it so we can only assume that it must have been her grandmother...my great grandmother. She found it and I can now identify it as hard rubber/vulcanite. It doesn't have the Novelty Rubber Company initials on it and I would imagine that it is British made in the early 1900's. I can tell that it is rubber as I get the smell of rubber when I rub it briskly. 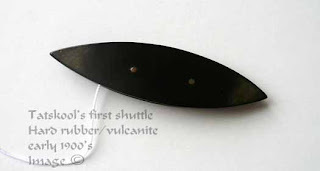 This was my only shuttle for years and years, until probably the 1970's when I discovered Aero and Milward shuttles. She soon wanted to learn to tat too. People always assumed when they saw us tatting that she had taught me...but not so. The funny thing was that she had to go out and buy a shuttle to use. She tatted regularly or the next 40 years. During that lifetime she only ever possessed three shuttles. She only ever tatted edgings. a chain...I can't find evidence of a chain. She never tatted with more that the one shuttle and she never tatted a motif. She knew exactly what she liked to tat and edged endless hankies...which she used...they would go into the washing machine every week. Sometimes she would tat an edging for a table cloth, or a tray cloth that she had embroidered. She was still tatting at 89 when she died some 12 years ago. It kept her fingers supple and her mind occupied. 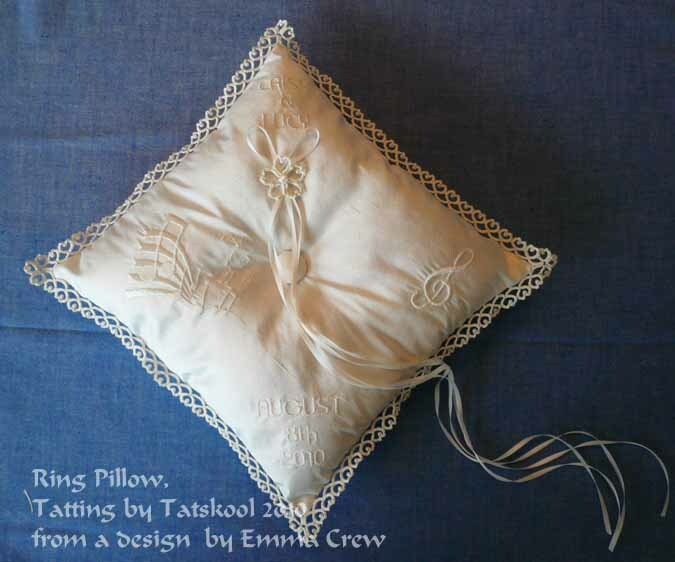 I have her little paper bag that she kept her tatting in,with her shuttles and the tatting that she was working on. I have given away some of her hankies to special people and have about 12 left...some that she used so often they have holes in the material...but the tatting is perfect. She really only did two different edgings, variations of the hens and chicks, and tatted in size 60 so good were her eyes. 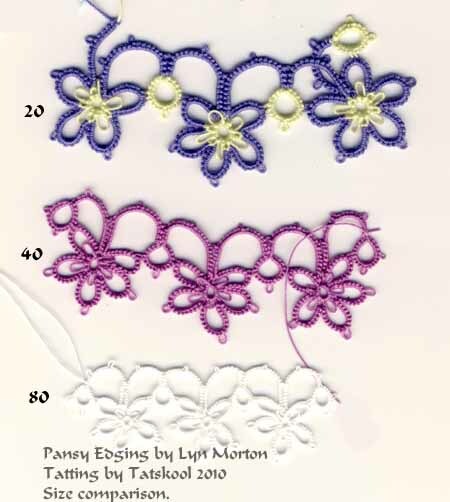 I prefer the tatting in the second one, it has more definition. 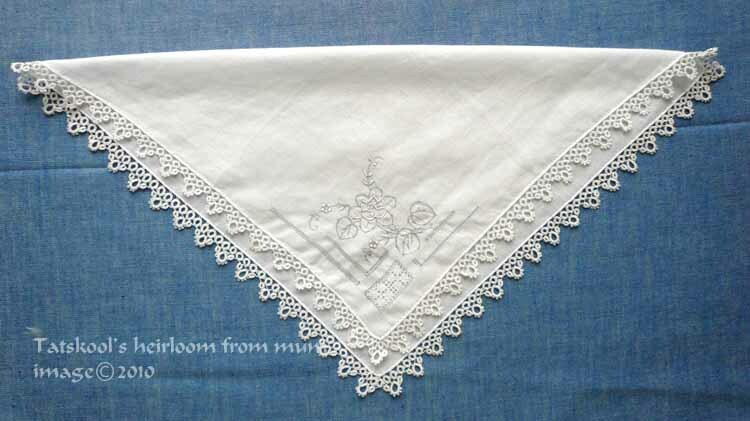 I don't know where she got these hankies from they are heirloom quality. 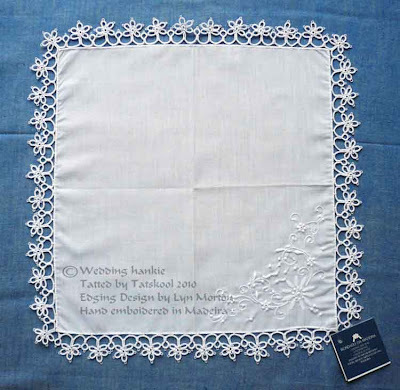 ...but also Drawn Thread Work and fancy filling stitches in he rectangular panel. I thought that it would be nice to give one to daughter in law to be. To have my son's grandmother represented at the wedding. He will like that, hope she will too. 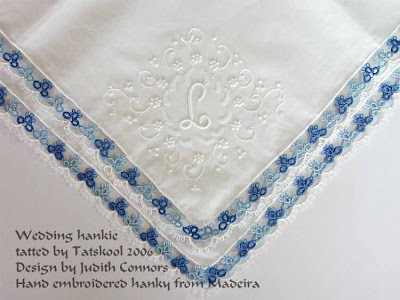 I chose one that fulfilled the something old, (made about 15-20 years ago), something new (it is) and something blue.....and this one filled the bill. Maybe she is sentimental too! I bet mum taught the angels how to tat! Played around with several different edgings. This one is Lyn Morton's Pansy Edging from her book Tatting Patterns. 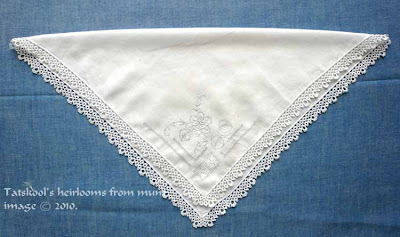 This is tatted in Coats Floretta 20 ( a bit smaller than Coats Mercer 20) in lavender and lime green. This one tatting only the rings in the lime green....and joining the chains together...gives a stiffer edging....not sure which I like best. Very pretty tho'. Looked at lots of others but kept coming back to this one. Looking good but not as dramatic. I tend to find that 80 looks a bit stiff, not soft and gentle.....as well as taking a lot more work so decided that 40 was fine enough. The hankie is a beautiful hand embroidered one bought in Madeira just a few years ago. 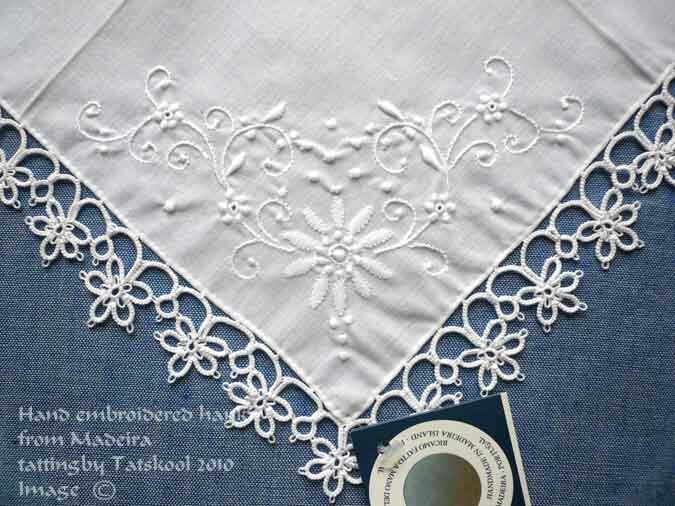 I bought so many as they were so gorgeous...I was very optimistic about my desire to tat edgings. This is only my third from my stock! 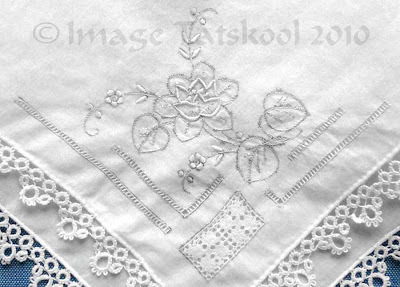 44 repeats of the design, only a few to go....should be finished in a couple of days.....fingers crossed! Here is the wedding hankie that I did for my daughter.....the hand embroidered hankies from Madeira are exquisite. and the other one that I did for myself.